Rachel returns to cruising after giving evidence in a difficult trial. She also wants to reevaluate her future after receiving threats from the man she helped put away. Taking Queen Cruises up on their offer of a free luxury cruise aboard the Coral Queen, she opts for a sailing to New York. Rachel’s best friend and cruise nurse, Sarah is also returning to the ship to start a new nine-month contract, meaning Rachel will have a friend on board. 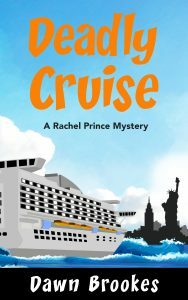 Almost immediately, Rachel meets a cruise tour leader who invites her to join him and his Russian tour group for some of their planned activities during the sea days. A mystery develops when a Russian crew member is found dead in his cabin and another one goes missing. Added to this, Rachel’s eagle eye spots some curious goings on among the Russian tour group. Sarah has problems of her own as conflict develops in the medical team when a new nurse is brought in at short notice. Rachel can’t resist doing a bit of snooping, but will she get to the bottom of a mysterious death and find out what’s happened to the missing crewman before they reach New York? I loved the first book but I have to say this one is even better. The action starts on the first page and characters from the first book are developed in such a way, I feel I know them. The plot is intriguing and I didn’t manage to work out whodunnit until the end. Great storytelling – keep them coming, Dawn Brookes!